Men never grow up. They think and act like children. That is my conclusion, having conducted recent research. The Spring Cottage Life show at the end of March is the stage for my investigations. 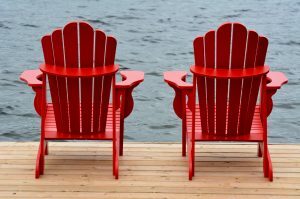 In the midst of this never-ending winter, it is the perfect time to check out all the new cottage products, the toys and gadgets that, in our mind, will add both comfort and excitement to our summer days. I’m especially excited this year because we have brought the kids along – which means more fun for a dad than simply having to trail off after a spouse on an agonizing, stop and go trek, through the endless aisles of Martha Stewart-like interior exhibits. 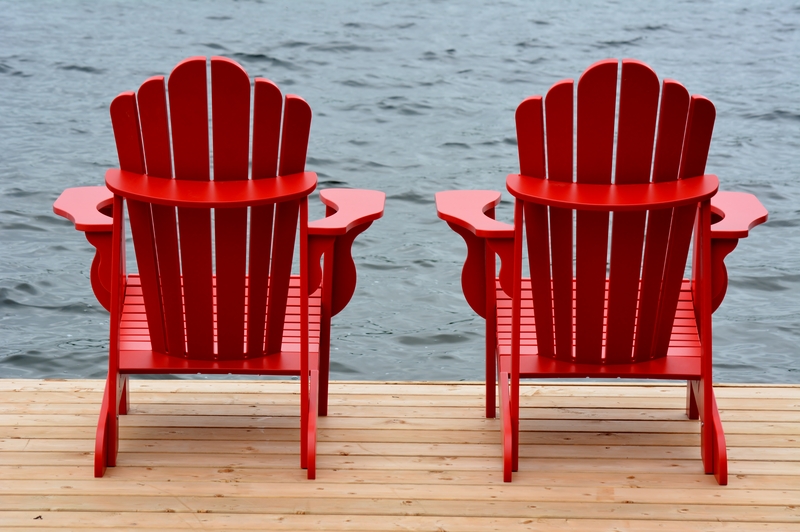 No, cottage life should be about fun in the outdoors, not inside entertaining. The kids won’t put up with the monotony of furniture, crafts and cutesy knick-knacks, I reason. Meaning this visit will be about fun and toys and … then comes the let-down, in one simple sentence. No! They will be climbing in and out of fancy new boats, checking out the latest in canoes, kayaks, catamarans and wind surfers, sitting dreamily on jet skis and hiking themselves out on some racy sailboat like a crew-hand in the America’s Cup. The girls will lounge briefly in the cushioned seats of pontoon boats imagining themselves hanging out with their friends in bikinis, while my son will play with the steering wheel of a ritzy cabin cruiser while envisioning himself as some multi-millionaire yacht owner. They will be kicked off a good many vessels by salesmen wanting to impress more legitimate customers. The kids will try on the latest water skis and boogie boards, bounce on water trampolines, practice fly casting, and try to climb into futuristic hot tubs. I want to be with them. Instead, my wife and I are hanging out staring at soapstone countertops that are “as attractive as they are durable and not only impervious to heat and stains, but virtually maintenance free.” I run over to a wine tasting exhibit to help me get through this, and then catch up to my darling wife drooling over a mammoth pine harvest table with eight sturdy plank chairs. “Wouldn’t this look good at the cabin?” she seems to be asking me, and I probably would have heard her, had I not been looking off with envy in the direction my four youngsters have wandered. She stops and listens to some talking head extolling the virtues of something called “Sham-Wow,” and then I see her take out her wallet. She hands me a small, square piece of very expensive felt and tells me she bought it for me to clean our old boat – “fellow said it would be just like new!” I run back over to the wine exhibit, swirl a Shiraz around in my mouth and tell the person that poured it, “Ah, full-bodied, with a distinct note of black cherry and a hint of pepper, if I’m not mistaken,” or some such thing that I had memorized from the information card. We meander through some food exhibits and sample feta stuffed mini pitas and little nibbles of chocolate cashew buttercrunch, so small that they are only a tease. We dip pretzels into little dishes of various sauces, while a lady explains to my wife the fine ingredients whilst glaring at me undoubtedly recognizing the classic vacant look of the typical double-dipper. A spicy chili concoction has me running back to the vintner exhibit, only to find that I have been cut off. Finally, mercifully, the hour is up, and we hasten back to the rendezvous point. Perhaps seeing my pain and sensing my agony, my compassionate children beg me to come with them for a brief look at all they have discovered. I cast my eye on the elegant lines and shining chrome of a polished mahogany launch. The kids drag me onward to the fancy ski boat, envious of all the bells and whistles, especially the enormous stereo speakers that I’m sure would be heard all around the lake. If that’s not loud enough for them, they marvel at a jet boat. With exclamations of approval, my son watches a video clip that shows the enormous, space-age craft zooming around a lake, belching fire out of its back end and sending a plume of spray 100 metres in its wake. My wife stares dreamily at a sporty Hobie Cat, I’m sure taking her back to the sailing days of her youth. There is a sleek wooden row boat, and I imagine rowing it around the island and over to shore each morning, a great way to get into shape. I show it to my wife, who imagines herself sprawled out in the bow sipping red wine, while I get into shape. Something new for the cottage dream list, somewhere ahead of the flatulent jet boat, but surely well behind a harvest table.